Boredom sets in. The ocean looks the same all around, 360 degrees of nothing on the horizon. And their microwavable food supplies start to run low. They sit down to eat some food and to make a plan. They know they'll have to stick together in these tough times. - One Sim needs to be “On Hold with Tech Support” again, they're still not giving up! - Try to get the relationship level to Good Friend. - Hobby as much as you like and have them eat from the microwave if needed. - One Sim needs to "Watch a Movie Marathon", the other reads Fine Literature (or a Novel for XP, if you have a pre-teen book case). Re: Day 4 of "Lost at Sea"
Hopefully next time I will have time to join a challenge. I am having fun listening to how your stories are going so far. I was on vacation and heading out to see the worlds largest pearl when I heard commotion going on at the pier....cameras peering through windows in a boat I walked up to one of the windows and looked in and to my surprise there was a crazy looking guy in a Mankini and top hat, that is when I realized it! I was at the filming of a reality show of two people stranded on a boat. Star struck & hoping for an autograph I started to knock on the window trying to get their attention they must be in a sound proof boat because they couldn't hear or see me. I can't wait to see the adventure these two have. These stories are amazing! I wish I had joined the challenge. 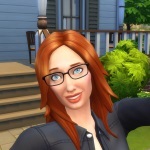 I would have created two more sims just for the challenge. mrs_smartt wrote: These stories are amazing! I wish I had joined the challenge. I would have created two more sims just for the challenge. While the challenge has started, you can play along as well. There is nothing preventing you from joining in in the fun! See the requirements post for what's needed. Boredom started to reach a peak. Captain Crazy ran back and forth through the boat like a chicken on the lose until Cassandra stopped him in his tracks. She pulled him over to the couch and sat down to talk to him. They discussed many things to kill the time and their relationship improved. Captain Crazy suggested they try something different and insisted they'd change into their swimming suits. When the captain returned from the bedroom in his swimsuit, Cassandra couldn't help but laughing so hard her belly started to hurt. Once she had caught her breath a little she wondered sincerely about Captain Crazy's sanity. She decided to do something about it and went to work on the fashion design studio in an attempt to make something better than the ridiculous mankini he insisted on wearing. Most of the food has gone. Their calls for help are reaching no one. They share a meal (one of their last?) together and discuss how to spend their day. Herman decides to watch some old movies while Lily spends the day reading. Later they talk. "So, tell me about your family," Lily said. "My first father who created, um, that is, well, he was a doctor. He didn't seem to want me around," said Herman sadly. "Oh, you poor dear, " said Lily, giving him a hug. Herman grins. "But my adoptive family was much nicer." "Are they the ones who left you this boat?" asked Lily. Although they've become friends boredom has gotten the better of both of them. Evelyn decides to try tech support again while Kaiden reads a book. Later both settle down on the couch to watch some old movies. Kaiden quickly falls asleep while Evelyn watches him sleep. She starts to feel as if something is about to happen, but what? She gets comfortable and gets stuck back into her movies. Kaiden finally wakes up feeling refreshed after his nap and decides to make some clothes ( maybe a new dress for Evelyn). He ,too, feels a strange pull when looking at Evelyn, like a desire to make her smile. He smiles to himself and starts on the dress. Water water everywhere... Was there really no end to it, there must be some land somewhere, surely or had the world just disappeared? "I'm bored" said Ricardo with a sigh, "look there is a DVD in the machine, let's watch it". As the show started they didn't know whether to laugh or cry as the title screen came up - Castaway Island... If only! They decided laughing was the better option and sat chatting while they watched. After the show they decided to just have some fun, they played some foosball, listened to music, danced, talked and laughed. Then it happened, as Tia spun round while dancing she came face to face with Ricardo and all of a sudden it felt too much like a date. Embarrassed by her thoughts, she mumbled, "I saw a book on the shelf I have been dying to read for years, I think I'll take the opportunity and go and read it now" and shot off towards the book shelf.